The other day a fine book arrived from England, a study by Christopher Webb Smith of South Africa. Christopher Webb Smith was in the Bengal Civil Service, lived next in South Africa, and then came to Florence for an active retirement, carefully painting all the great works of art in the Pitti, a work which is now lost. But his South Africa volume survives, is published and is lovely. This copy came smelling rather of English dampness so we took it out to his tomb as we usually do with our books reuniting them to their authors buried here, reading together title page and tomb inscription. And we decided to leave it sunning on his tomb for the next few hours. And all our visitors came saying - and marvelling - 'There's a book on a tomb!' So we explained to them our tradition. Then I found on the web that Gozzini's, an antiquarian book shop just down via Ricasoli from San Marco, was selling a copy of Mary Somerville's work. So off I went on my bicycle to get it. The Italian translation published in 1861 had already been sold. So instead they gave me for the same price the English original. Now Mary Somerville, unable to attend university or gain a degree, taught herself algebra, discovered a planet, was a member of the Royal Society, taught Ada Lovelace, Lord Byron's daughter, mathematics, Ada in turn with Charles Babbage inventing the computer, as Ada suggested to him the use of Jacquard loom cards, IBM punch cards. Mary buried her husband William Somerville here, being buried herself in Naples with a magnificent tomb raised by her daughters, showing her full size. This is a children's version of her life on the web. We took Mary Somerville's book to her husband's grave, reading both title page and tomb inscription. 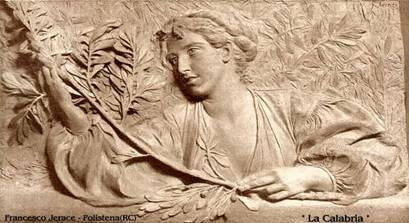 Perhaps someday we can visit her tomb in Naples, with its fine realistic sculpture by the Calabrian Francesco Jerace of Mary as she had been in her nineties, still writing books used as texts by students at Cambridge University. Browsing on the web looking for the image of Mary Somerville's tomb in Naples by the twenty-year-old sculptor, Francesco Jerace from Calabria whom Martha Somerville commissioned to do the work, I suddenly did a double take. 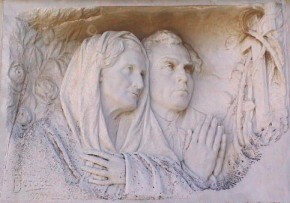 For another sculpture by Jerace of his parents showed his mother as just like Anne Susanna Horner, buried here in a tomb with a portrait medallion, the same hand, the same veil, almost the same face. The Horner family is fascinating, Leonard Horner translating Pasquale Villari's book on Savonarola, his two daughters, Susan and Joanna writing a fine guidebook to Florence which we give on the florin website, and Susan also keeping a diary, now in the Harold Acton Library of Florence's British Institute. Excitedly I told my friend, Alyson Price, of the find. Then apologised. It wasn't possible. Jerace was only ten years old when Mrs Horner died. No problem, Alyson e-mailed back, for by the time the tomb was commissioned, likely by the Horner's friend, Martha Somerville, he had turned twenty! 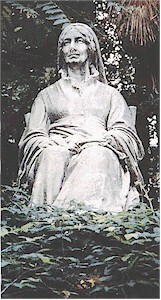 As we can see, Mrs Horner's tomb with its sculpture by Jerace is in great need of restoration. The pietra serena base has fallen apart and the marble it supports is at risk. We have now restored Elizabeth Barrett Browning's tomb, thanks in part to Tony Moulton Barrett, finding in our files that Moulton Barretts in the past have also seen to its cleaning. We have restored Arthur Hugh Clough's tomb, thanks to the Museo Archeologico Nazionale, because of its design taken from the Marchese Torrigiani's copy of Champollion and Rosellini's book of their Expedition to Egypt and Nubia, the year following this Cemetery's founding, both aided by the Grand Duke of Tuscany. We have repaired Isaac Lumley's tomb, thanks to the kindness of Joanna Lumley. Jean Pierre Vieusseux's tomb has been restored by the Opificio delle Pietre Dure, and likewise Holman Hunt's tomb, sculpted by himself, for his wife Fanny. 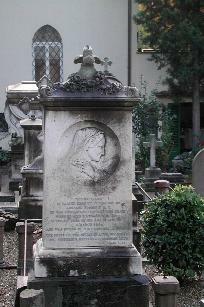 While Iris Fromm, a woman master stonemason, came from Bavaria and in two weeks repaired 28 of the most scandalously broken tombs. Now we await the restoring of Fanny and Theodosia Trollope's matching tombs with Thomas Adolphus Trollope's Latin inscriptions to his mother, his wife, and the tomb of cantankerous, marvellous Walter Savage Landor, as well as the tombs of the Checcucci family whose vandalized tombs and inscriptions we restore with the help of their family members, as far away as Australia. In 2007 shall be the 180th anniversary of the 'English' Cemetery and I am plotting a ceremony where we bring their books to their tombs, EBB's, Isa Blagden's, Theodore Parker's and many more. Meanwhile someone has given 150 euro worth of daffodil bulbs, as a memorial to her aunt whose ashes have now gone from Florence to New Zealand. We shall be planting these this Sunday. Because I know of such daffodils planted 100 years ago in an English churchyard by the graves of two Anglican Sisters, which still propagate themselves as a marvellous carpet of gold each Spring. Our irises will need dividing and replanting in August as they too are propagating their kind. These the true purple Florentine lily that grow wild in these parts. Particularly I want a pomegranate by Elizabeth's tomb as both she and Robert wrote of them. Talking of which our 'Egyptian Motives in the English Cemetery' event and ongoing (through May) exhibition in the Museo Archeologico Nazionale certainly taught us that tombs must have portraits and names for the 'Ba', the 'psyche', the Soul, to return. EBB's name in her family and by Robert was 'Ba'. We have now given her name by her tomb not merely the E.B.B. placed there. 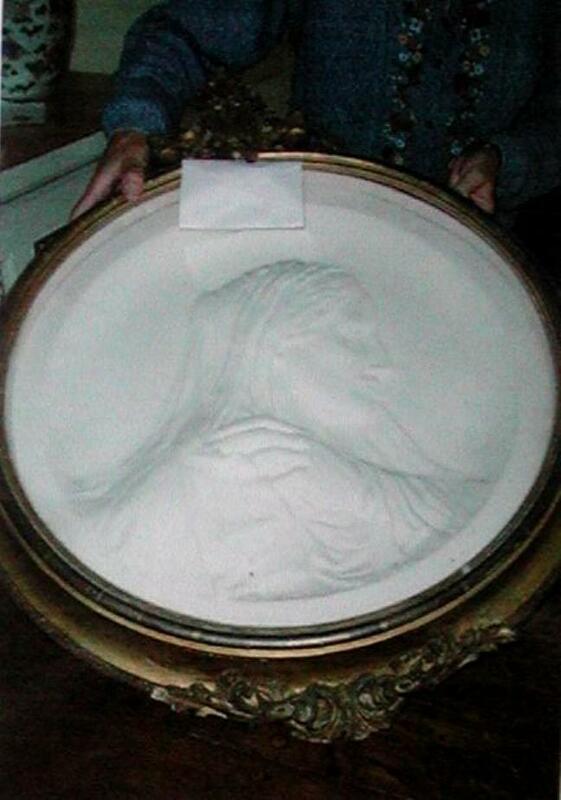 And Amalia Ciardi Duprè is sculpting two tondos, one of Elizabeth, the other of Robert, from the Gordigiani portraits, to go on the Gatehouse wall facing the tombs, so she shall also have her portrait here. Would some kind benefactor be willing to gift these to the 'English' Cemetery? 'That the Swiss-owned, so-called 'English' Cemetery in Florence be kept open, be restored and be declared a UNESCO World Heritage Site', and with 1800 signatures in-house from our visitors, for a total of 3069 signatures. We have decided to keep them coming.